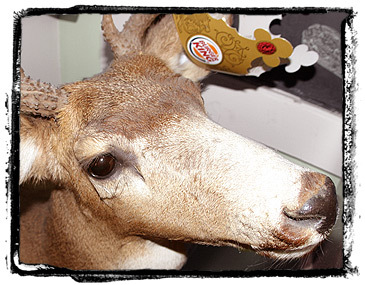 In years past, when it wasn’t a disaster zone — just an ugly room, we’d gotten comments like, “I like your reindeer” in reaction to the deer head we once had mounted on the wall or “Oooooh! I LOVE Harry Potter” in reaction to a bus shelter poster we once had up. The older kids would usually be very interested in the stand-up arcade game. Now that we’ve torn the room apart, the “reindeer” is in the attic — partly because it’s kinda creepy and partly because I’d consider myself to be anti-hunting, and all too often people would ask if it was “my” kill. Sorry, I couldn’t shoot Bambi. I’ll keep his head in my attic, but I won’t shoot him. The Harry Potter poster has been moved upstairs to our “computer” room where I’m typing this right now. It’s just a really nice poster — not nearly as tacky as it might sound. And the arcade game, well, it’s still down there as Heather noticed, but for Halloween this year, I left it unplugged and I hid it behind a photo backdrop in an attempt not to draw *any* attention to my house. Well, that was unexpected. Maybe this was the same little girl that thought we had Rudolph mounted to the wall a few years ago and never forgot. Or, perhaps, she was just being polite, like so many of the kids were. A little off topic, but the lack of parity is disturbing. Most kids at least say “Thank You!”, but many of them, dare I even say MOST, went so far as to say “Happy Halloween” or “Have a great night!” too as they ran off with handfuls of candy. When I was still trick or treating, I don’t ever remember saying much more than “Trick or Treat!” followed by a quick “Thank You!”. Seems the kids are getting more and more polite. So, anyway, back to the little girl that thought we had a cool house… I’m not sure where that came from, or if that was her own personal version of “Have a great night!”, but it left me really confused. Kids have such a skewed look at things when they are at a trick r treating age… you never know tho maybe the girl was from the “other side of the tracks” – like Molly Ringwald’s character in Pretty in Pink and would appreciate anything better than a shack… and I knew some boys like that – ones that made bruitally honest statements that just embarassed the parents when they were within ear shot! I like the room myself for the potential it holds!!! It will be gorgeous someday!